House Telvanni is one of the Great Houses of Morrowind. 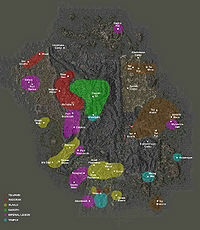 It governs the Telvanni District of eastern Morrowind, and administers the eastern portion of the Vvardenfell District from its council seat in Sadrith Mora. The house comprises mainly highly egocentric and ambitious mages, and is known to many as the house of the master wizard. Here, it is common to rise through the ranks by eliminating or otherwise 'indisposing' other members. Of the Telvanni lords, only Master Aryon of Tel Vos - the youngest and newest councilor - seems able to look beyond the end of his own nose and at the concerns of other people; the rest want little more than to be left alone to their research and ambitions. The other members are similarly isolationist in outlook and do not intend to be presided over by any of the other institutions, predominantly the Guild of Mages. To join House Telvanni, travel to Sadrith Mora and speak with the Mouths in the Telvanni Council Hall. Normally, you can join only one Great House in the game, but there is a way in which you can join both House Telvanni and House Hlaalu. For details on how to do this see the Glitches article. If you are expelled, you can make amends with anyone ranked Mouth or above, except Therana. You can rejoin as many times as needed. Bug: Some people have reported reaching the rank of Master in the House, then being unable to advance any further. For more details and tips on how to solve this, see below. ¹ Requires completion of Stronghold Phase 2. Until it completes Aryon will tell you that you must complete more quests. Muck: Retrieve five pieces of Muck for some potion making. Black Jinx: Find a magical ring somewhere in Sadrith Mora. Sload Soap: Retrieve five pieces of sload soap for Neloth's research. Mission to Nchuleft: Retrieve plans from these Dwemer ruins far west of Vos. Coded Message: Deliver a coded message to Divayth Fyr in Tel Fyr. Amulet of Unity: Help Eddie to retrieve this magical amulet from the mainland. I can grant you the rank of Master now. That will give you an equal place on the Telvanni Council. But if you aspire to a higher claim, I can also grant you the title of Magister. By accepting the title of Magister, you are announcing that you deserve the title of Archmagister more than Gothren who currently holds that rank. Which will it be? However, some people have mentioned that they have problems advancing to Archmagister even if they did not choose to have the one time advance to Master, which leaves them stuck at the rank of Magister. This problem comes from getting too many advancements. In particular, when you ask for advancement after you are a spellwright, but before you have recruited a Mouth, Master Aryon will promote you to Wizard. Then when you recruit your mouth, you'll be advanced to Master, and the game will assume you didn't want to be magister. If you have the patch, an expansion, or Game of the Year Edition, there is a way around this. Speak to Aryon again (topic Magister again). You have foresworn the title of Magister... But perhaps you have changed your mind. Will you fight Archmagister Gothren and claim the title as your own? You should choose to fight Gothren, kill him, and return to Aryon to be named as the Archmagister. The last option for those playing the PC version of the game is to use the console. Open the console using the ~ tilde key and enter the command: PCRaiseRank "Telvanni"
When asking for advancement at rank Wizard, Aryon will say "You must perform more chores before I would be willing to consider you for the highest ranks of House Telvanni". At this point, doing more chores for the other Telvanni will change nothing: what the player has to do is complete the first stage of the stronghold to make Aryon's chores available. Though not game-blocking, this is in a way related to the previous "Telvanni Master bug": if the player has completed the quest to recruit a Mouth before asking Aryon for advancement, Aryon will never mention having to build a stronghold. The player needs to speak with Llunela Hleran of their own initiative. If you are playing as a vampire, you can join House Telvanni and advance in ranks, but only as far as Spellwright. The reason is that the quest Wizard Spells relies on a custom greeting from Master Aryon to check if it is completed. If you are a vampire, Aryon will not deliver this greeting, but rather a standard vampire greeting. In general, you will be able to attain the ranks of Mouth and Spellwright but not build a stronghold (Duke Vedam Dren does not speak to vampires). But if you want to advance further, you will have to seek a cure from vampirism, in order to get the correct greeting from Aryon.